I just joined this forum a few days ago and have to find my way around still. 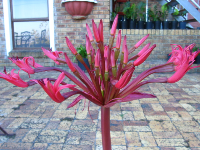 Firstly I have been growing Clivias for about 10 years. They are grown under the shade of large trees and the special mature plants and most seedlings are grown in four shade houses. I have been growing bulbous plants from the Amaryllidaceae family from my home country South Africa for about 20 years and since extended the collection to bulbs from all over the world. I will post some of the plants that flowered recently and hope you will enjoy them. Here is one of my Brunsvigia orientalis flowers a few weeks ago. 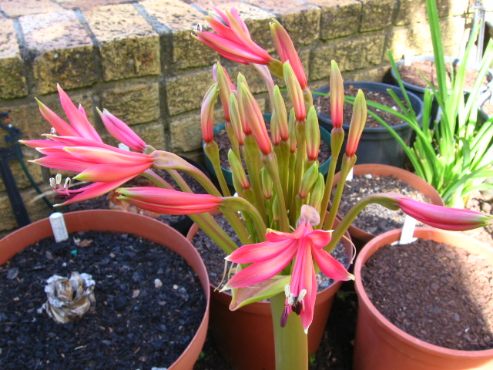 This is a Brunsvigia litoralis just starting to open some of her 72 florets. 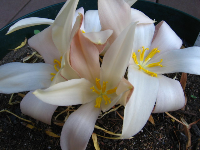 This is a family of about 14 Gethyllis ciliara bulbs and seven flowers. 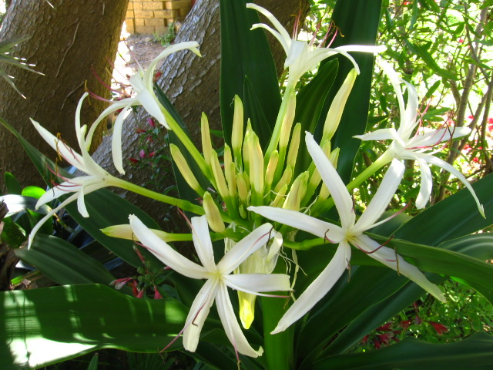 They give only one flower per bulb.They give off a lovely scent. This is a Crinum asiaticum with about 50 florets. I do not want to bore you so early therefore I will post some more photos later. 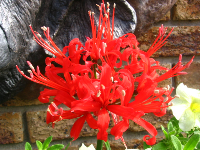 The last one is Nerine sarniensis. One of my favourites in the Nerine family. thanks for sharing your photos - sounds as though you have a great collection - look forward to seeing more pics - I certainly am not bored. Love all the different bulbs. They are truly amazing flowers and I hope that one day we will see them growing here. You must be a great expert on these plants, Heinie! Oh how I would love to grow some Brunsvigia and enjoyed looking at your photos. This bulb is very hard to come buy in Australia. I look forward to more pictures. Thank you Peggy I have 3 Brunsvigia orientalis bulbs flowering now. If anybody would like some seeds of the Brunsvigia orientalis I am happy to pollinate some flowers and send the seeds to one person in Australia to re-distribute there to other members who would like seeds. I have a Brunsvigia radulosa flowering now too. I will post a photo here soon. I will cross the above 2 Brunsvigia species with Amaryllis Belladonna and reverse cross them too. I do this cross every year for the past 3 years and the bulbs grow well. There may be some of the seeds from the crosses too. Watch this space for many photos to follow. Here is a photo taken this morning of the same Brunsvigia orientalis in the first photo above when it flowered last year. There are at least 15 more flowers this year. Hi Heinie, The Brunsvigia orientalis are a magnificent plant. I love bulbs, they are such hard working little things and produce such fantastic blooms with not too much effort. Amazing how you are able to pollinate and cross them back and forwards and get good results. 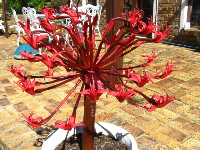 Here in Australia,the Brunsvigia orientalisa is usually not available. I would be happy to receive any seeds and distribute them to other members.